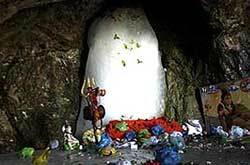 Udhampur (Jammu), June 17-Over 25,000 devotees including men, women and children of all faith witnessed 3- day Historic Sudhmahadev Mela started on Jyeshtha Purnima( full moon ) of Bikrami Era being observed at Sudhmahadev in tehsil Chenani of district Udhampur which concluded with traditional fervor and gaiety here last evening. During the three days of the Mela devotees took bath in the Beenisangam called Budhisudhi rivulet, which flows out from top of the Dhar Shivgarh and is considered an abode of innumerable saints. Therefore, many devotees took bath in sin destroying spring (Pap Nashni bowli) situated just at the entrance of the temple, about which it is said that a holy dip in this spring shuns all evils. During the festival, the folk artist belonging to surrounding areas turned up in large numbers to sing folk songs of the areas highlighting various aspects of civilization with special reference to Lord Shiva. Number of cultural troops from all parts of the state also throngs into the mela which was highly appreciated by the round of applause. 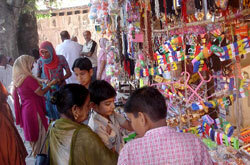 Number of temporary sweet shops, toy shops and other eatable corners by the locals as well as outside vendors were the main attraction for the general public visiting the mela site. Outnumbered children were seen enjoying the handola rides. On the occasion Department of Youth Service and Sports Udhampur and Information Department also arranged cultural programme for the entertainment of people at the Mela site. During the mela days the Checking Squad headed by Mela Officer, Tehsildar, R.K. Anand, inspected various shops including dhabas, fruit and vegetable shops, tea stalls, karayana stores etc and realized a fine to the tune of Rs 13,900 under Essential Commodity Act. The team also destroyed unsound fruit and vegetables on the spot. The checking squad also warned defaulters to remain careful in future so that the health of the people would not be affected. For the successful culmination of the three-day festival, the district administration of Udhampur had made elaborated arrangements of security, drinking water and power supply, medicare, traffic regulation, additional bus services and stock of commodities etc..